Is a brother of Lord Brassey, and a popular sportsman. He was born in 1844, and educated at Eton and University College, Oxford. At Eton he rowed in the Eight of 1862. Mr. Brassey has been for more than thirty years an enthusiastic yachtsman. 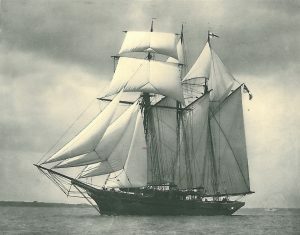 With the aux.-screw schooner Czarina, which is as famous in her way as the Sunbeam, he cruised up as far as Iceland in 1888, and he visited Norway, the Baltic, and the Mediterranean. From 1895 to 1905, with the exception of 1902, Mr. Brassey was unable to give any time to yachting owing to his Parliamentary duties. He has been master of the Heythrop Hounds since 1873, and is a member of the Yacht Racing Association. Clubs: Royal Yacht Squadron, Royal Albert, Royal Cinque Ports, Royal Corinthian, Royal St. George, Royal Thames, Royal Ulster, Royal Victoria. Residence: Heythrop, Chipping Norton, Oxon.